About the mystery bag: Mini features a brand new GLOSSY product from our upcoming line of JUST LIPS, 2 fun new colors from upcoming collections, a winter “must have” hand sanitizer, plus a matching body lotion in a new luvable scent! Another month with full size polishes. I don’t mind either way, the smaller sizes are nice because I feel like I’ll never use up the bigger sizes, but I also feel like it’s easier to see how gorgeous the colors are with the bigger bottles. 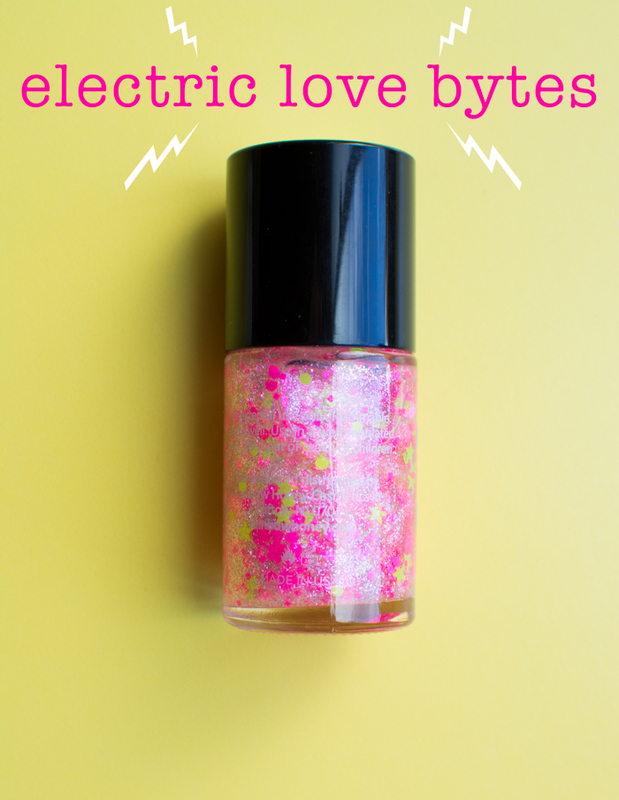 The nail polish above is called Electric Love Bytes. Cute name! 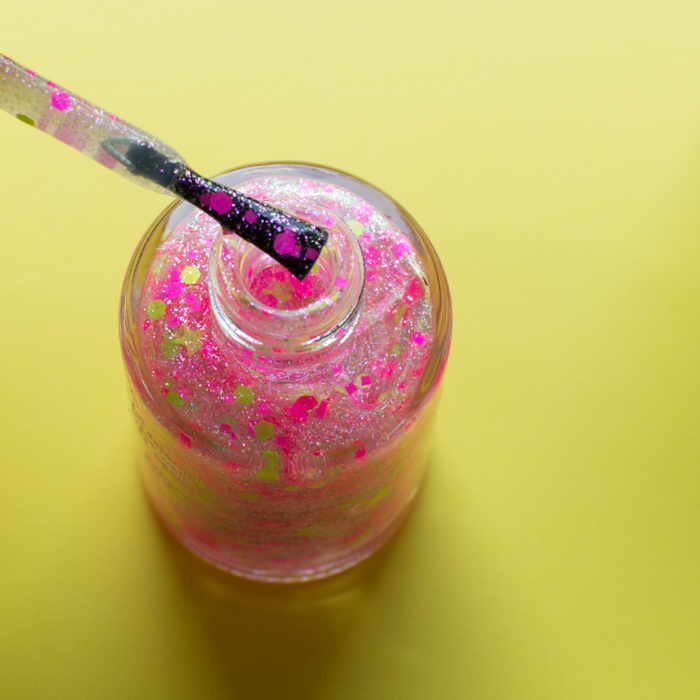 This glitter topper has a clear base with silver-pink shimmers plus hot pink and neon-yellow glitters. The second color is Violetta Bot. 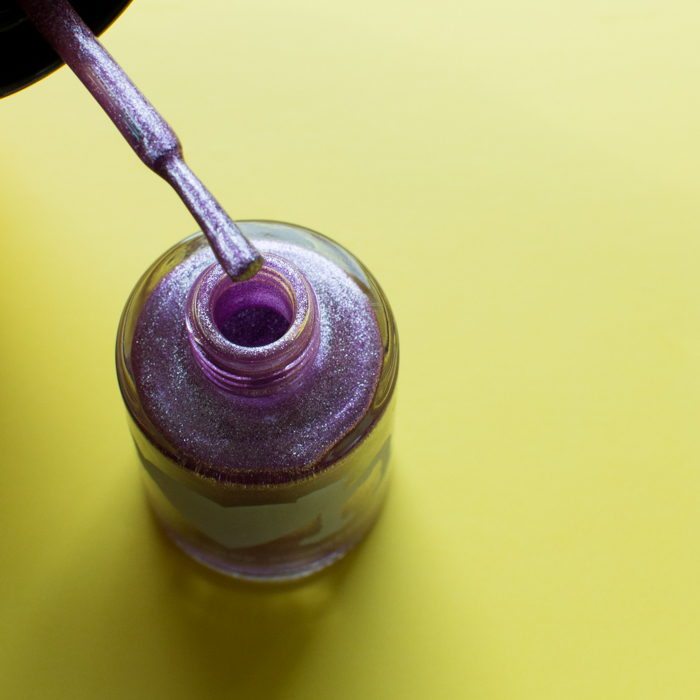 As you can probably tell by the name it’s a beautiful bright violet color saturated with shimmery metallics. The Robots collection will be coming out soon and they promise to have a lot of options. On the skincare side we received body lotion, hand sanitizer, and lip gloss. Both the body lotion and hand sanitizer are under the Luvable Pink collection—a blend of citrus, pomegranate, violets, pears, vanilla, and a soft musk. I’m obsessed with the scent! The lotion left my hands feeling silky soft almost velvet-y thanks to the sunflower oil and vitamin e.
I’m not one to use hand sanitizer unless on a hike or after a porta-potty, but I’m so glad to have this ready to go for those times. Because of that I will probably keep it in the car—where we usually use it. Last, but not least there’s a cute little mini lip gloss with roller ball application from their new JUST LIPS collection. I received Concord Grape and it smells like fake grapes, but in a good way. If you had given this to me in my Dimeatapp-infused childhood I probably would’ve hated it, but I’ve outgrown that aversion. The formula is oil-based with coconut and shea butter oils. It’s extremely nourishing and hydrating. Other flavors available are Strawberry Breeze, and Dulce de Leche.